Dr. Amy Marder is the Director of the Center for Shelter Dogs she oversees her Match-Up II Shelter Dog Rehoming Program, which is one of the only behavioral assessment programs undergoing scientific validation. Dr. Marder also provides private consultations to pet owners and lectures at conferences in the US and internationally about animal behavior issues. Additionally, as an adjunct faculty member at the Cummings School of Veterinary Medicine at Tufts University, Dr. Marder hosts veterinary students from around the country for behavior externships at the Animal Rescue League of Boston. Dr. Marder is a veterinarian and a Certified Applied Animal Behavior Consultant through the Animal Behavior Society. She is a graduate of the University Of Pennsylvania School Of Veterinary Medicine and completed the very first residency in veterinary behavior at the same institution. For over 20 years, Dr. Marder helped owners and their pets with behavior problems through her private practice New England Veterinary Behavior Associates. Dr. Marder served as Vice President of Behavioral Medicine at the ASPCA in New York City for two years, where she founded the Center for Behavioral Therapy. During her time at the ASPCA, Dr. Marder studied behavioral evaluations of shelter dogs with the purpose of developing an objective and predictive test which could be used in animal shelters. 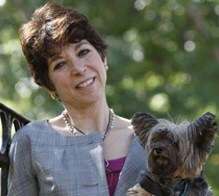 Dr. Marder has written two books and edited another for pet owners on general pet care. She was also the author of Prevention Magazine’s “Your Healthy Pet” column and has been a frequent contributor to veterinary textbooks and journals. Dr. Marder is often asked for radio interviews and to appear on television shows such as 20-20, Geraldo Live, and programs on Animal Planet.